In health we have been learning about our digital footprint. For example if we go on you tube we leave a digital footprint online. The photo above and all the logos in the foot are my digital footprint for the past 2 days. 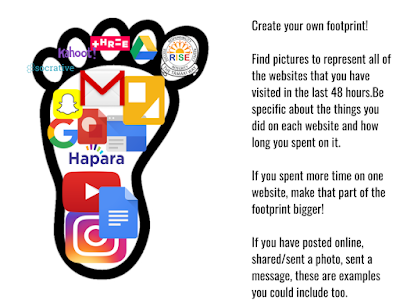 We are learning about the digital footprint because in the junior school it is a common problem that kids aren't aware of the consequences of their digital footprint they leave behind. Completing this digital footprint is a reminder to me on what I things I need to spend more time on to be successful in school.